LET US TAKE THE ROOF OFF FOR SOMEBODY! Sometimes it takes effort to get into the presence of Jesus. When obstacles present themselves and we exercise mountain-moving levels of faith we gain Jesus’ attention. Join us as Bishop Lambe emboldens us to effect change by engaging in self-less acts of faith on behalf of others. Ruth Ann and I are so thankful that you chose to be a part of our ministry at the Chapel of the Anointing and for viewing Concepts for Living our International Telecast. I hope this message will bless your life and continue to be a blessing to you and your family. As our ministry continues to grow I hope you will continue to grow with us. It is our mission to be a voice in the world that encourages people to change lives through the word with faith support and loving kindness. Concepts for Living Episode Reminder Get a sneak-peek into each new show plus daily featured articles, delivered straight to your inbox! 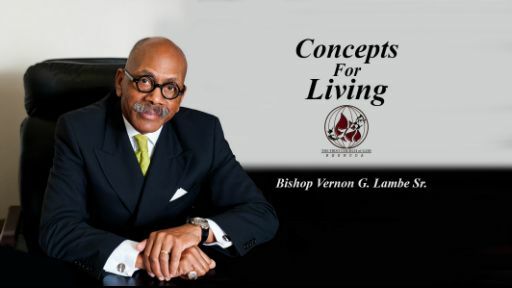 Concepts for Living with Bishop Vernon G. Lambe Sr., provides biblical principles for solving contemporary problems. Learn how to apply the Scriptures to your everyday life, and be inspired to walk in victory as Bishop Lambe challenges you to build on your faith and your relationship with God. Bishop Vernon George Lambe Sr., Dip. M.S., M.B.E., J.P., D.D. Bishop Lambe, a veteran church leader of 46 years in Bermuda and the United States, overseas the congregations of the Church of God in Bermuda. Because of his commitment to the community, he has initiated numerous social programs which benefit preschoolers, elementary schools, high schools and senior citizens. He has served on 12 Government Boards and Commissions. For his service to the community and his country, he was recognized by Her Majesty Queen Elizabeth II with an M.B.E. (Member of the British Empire). Bishop Lambe is well respected both locally and internationally, resulting in a significant demand on his apostolic call, leadership skills and administrative abilities. To order ministry resources or to give a finiancial gift to the ministry, you can visit us online at: www.fcogchapel.org.